"If some day... 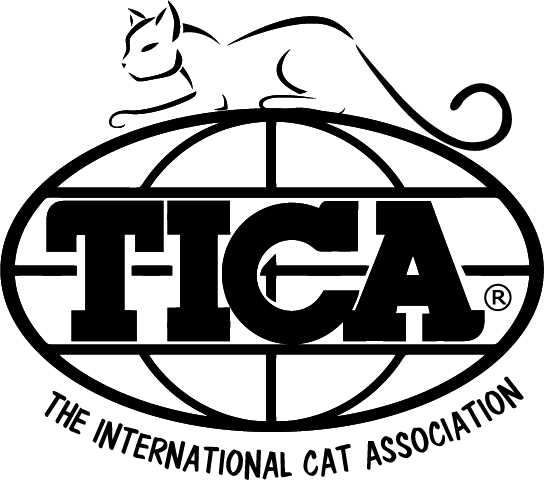 If someday a IW is born in our cattery..."
Our dream became this year by the 2013-2014 TICA Show season. Albert, born in our cattery became IW SGC LH 24th Best CAT. Albert was born in Oct. 2012, as an only son of Cindy and Cascade Mtn. Einstein of Popokilani. 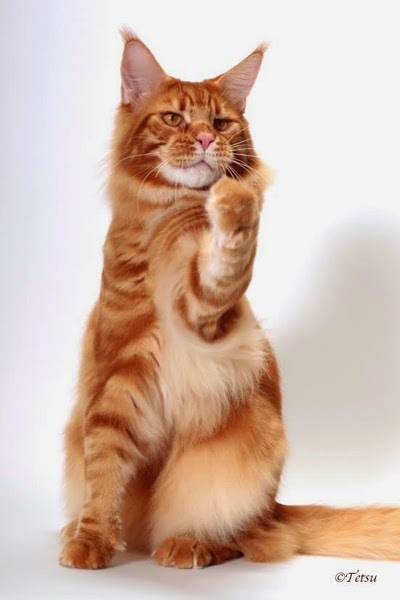 He is a Red Classic Tabby boy and the very first litter of Cindy. His Dam and Sire's first litter. Cindy was really a perfect mother even this was her first experience. Albert's Show debut was on Oct. 2013. He started his career from a bit old. He attended couple of Shows when he was a kitten but started his real career from almost a year old. 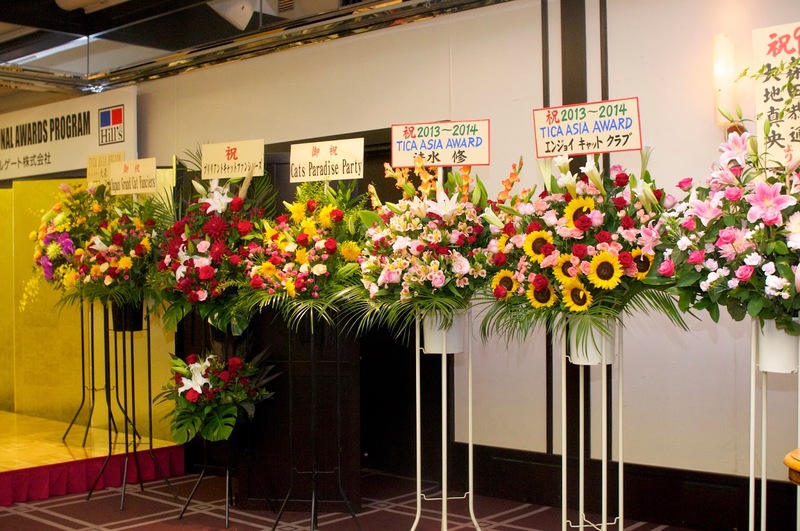 Till end of Dec. he participated the Shows held in Japan. He got the SGC title during that term. 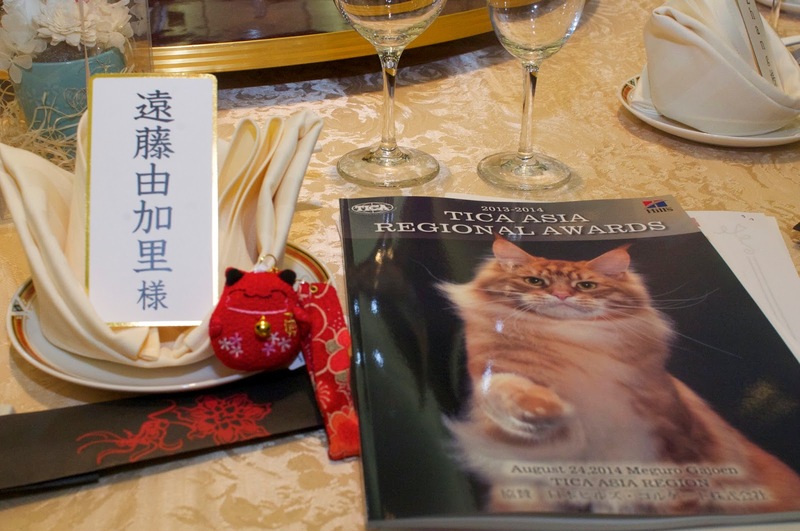 At end of Jan. 2013, we took him to TICA International Cat Show held in Portland. it was a big show and there he won 5 finals. This result made us to decide and was the beginning. 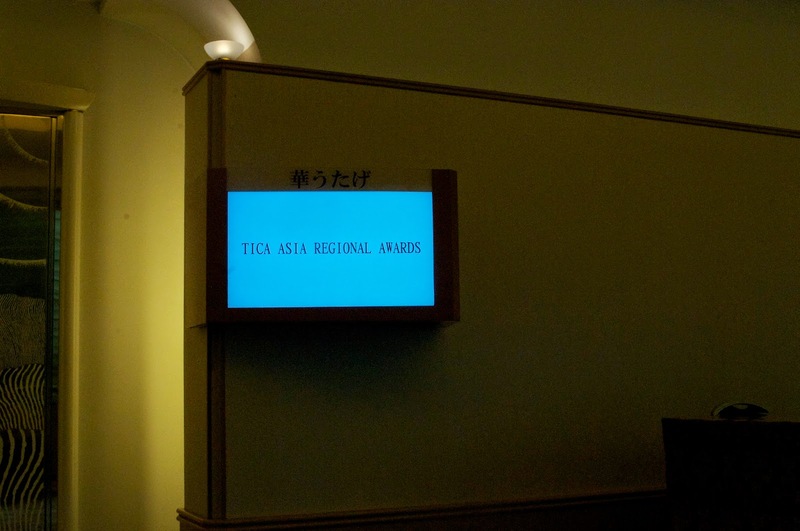 On this August 24th, TICA Asia Region Regional Award PArty was held at Meguro Gajoen. Tokoyo. 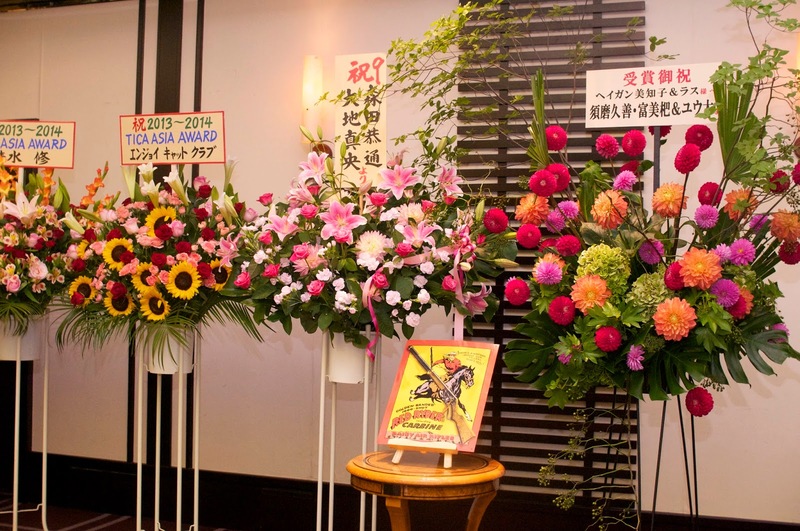 Many many flower stands were decorated at the hall. From each clubs, to the winner them selves... No need to worry cats messing those or think about the damage... Yes the hall was Cats Free (I mean no cats)! I had a chance to enjoy those colors and smells!!! I went there by car, so no alcohol as usual. I don't drink so no problem anyway. 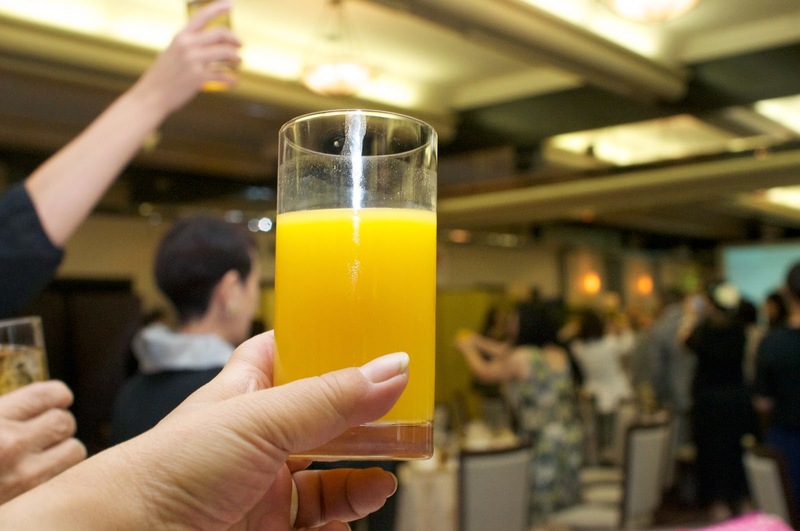 Lift the glass for "Cheers (Kanpai)" filled with orange juice. These are this times rosetta. And the one in middle is for SGC. 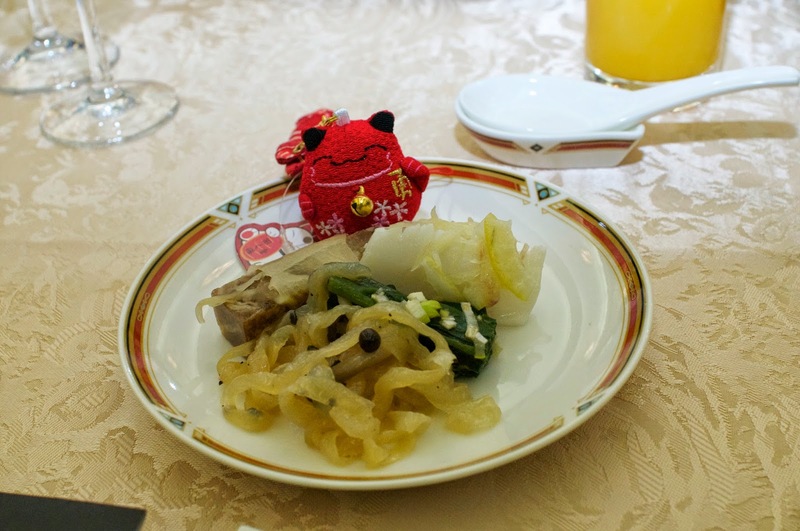 It is a souvenir for the SGC cats but can not receive it if you do not pay the party fee. This times"Fellow ship of the trip" was this red cat. And here he is too! There was a young couple attending the party. 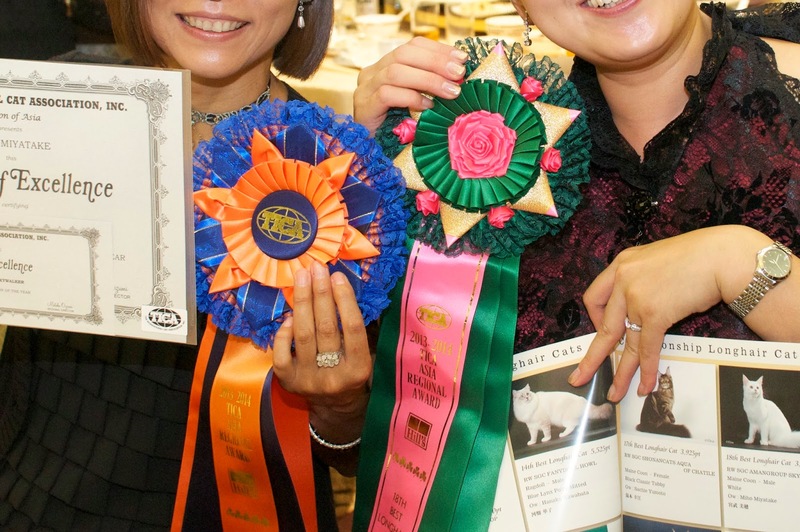 They are Ragdoll breeder and RW winner in kitten class. 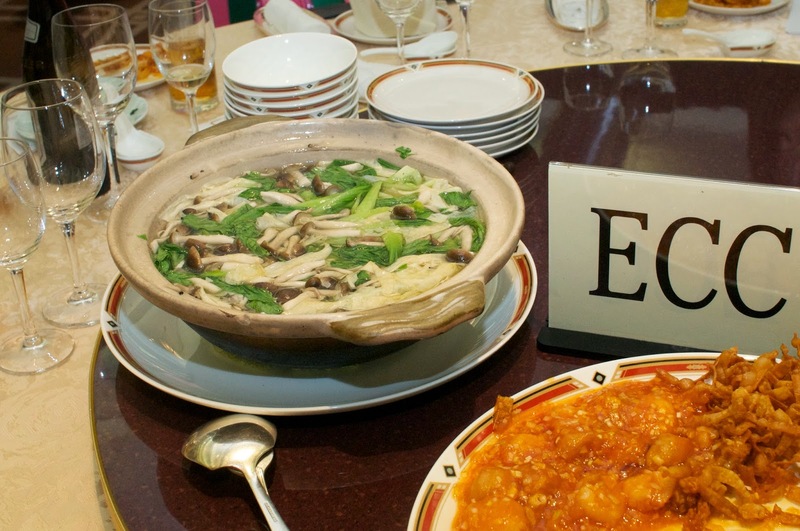 They came from Beijing, China. So nice and sweet couple they were. It is so nice to have Winners coming from different countries. Felt like we are still open to any cat fanciers! 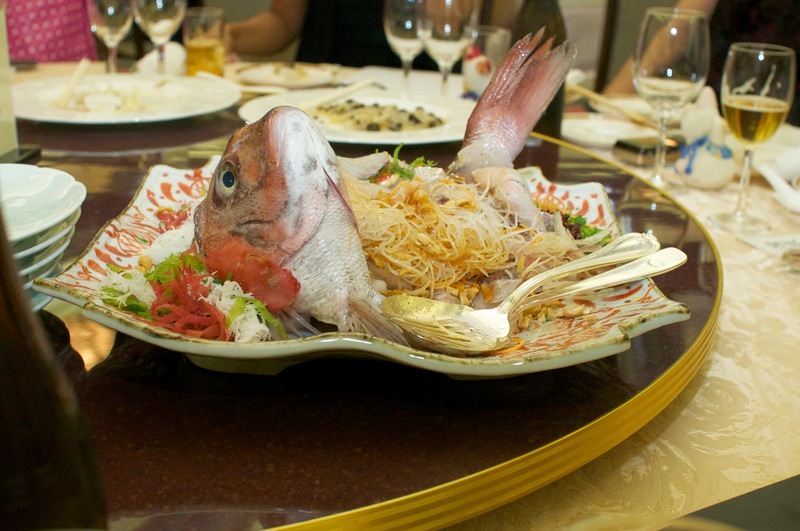 This was the main dish. 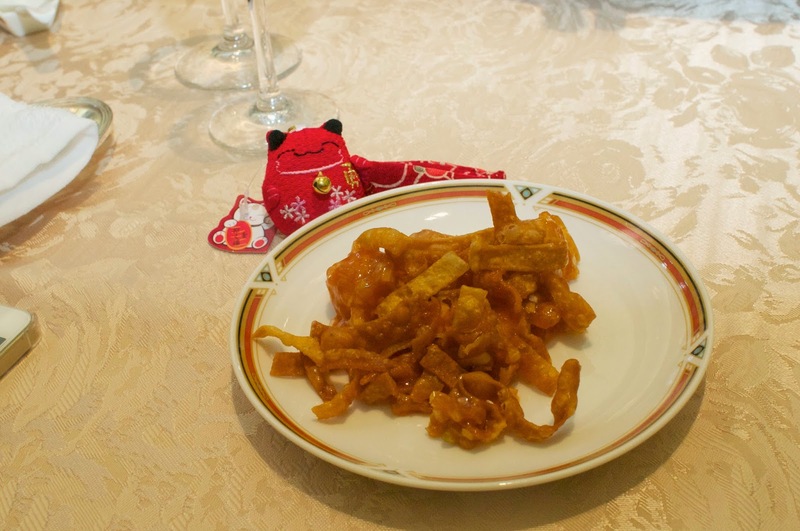 With the noodle made from rice powder! Was bit spicy but really delicious! These 2 ladies are my cat friend also cat relative. The left lady is the MC breeder, cattery Aman Group, and the right lady is the owner. One of my red boys in the past moved to Aman Group and his offspring, a White MC boy was shown and became RW SGC. A beautiful white MC, Aman Group Luke Skywalker. Congrats! 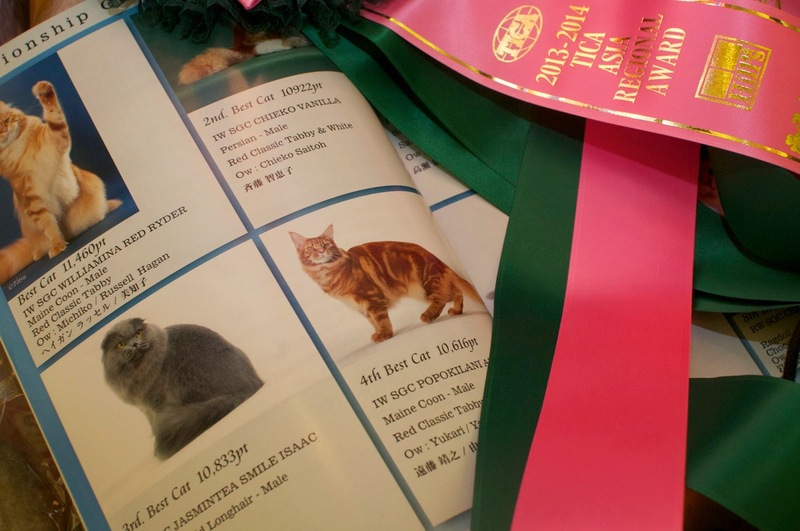 This red boy, IW SGC Williamina Red Rider was the Best Cat in Asia Region. And he is also IW AB winner too. 2013-2014, there were 4 red MC was participating. I think it is not so common to have 4 reds in same year, especially when the entry numbers are getting low. The shows held in Japan, every time where we go there was a red colored MC! It is now a laughter and sweet memories to keep. And as they were also there we attended all the shows and got this result. I sighed a lot but now it is a really good memory! Thank you to the 3 reds! It was nice sharing the same show and competing! Alberts IW rosette and plaque are to be bringing to Japan by some one who is attending the Annual Party. I wish I really could go but this time not... Will do something special for these items. I think all the fun things relating to this shall easily turn into the "Good all days" by next Summer. Albert was not born to become a Show Winner. He was born to live his own life as a "Cat"! "SHOW CAT" days are now really over. I just wish him to live his own life as a "CAT"! Healthy and spoiled life! 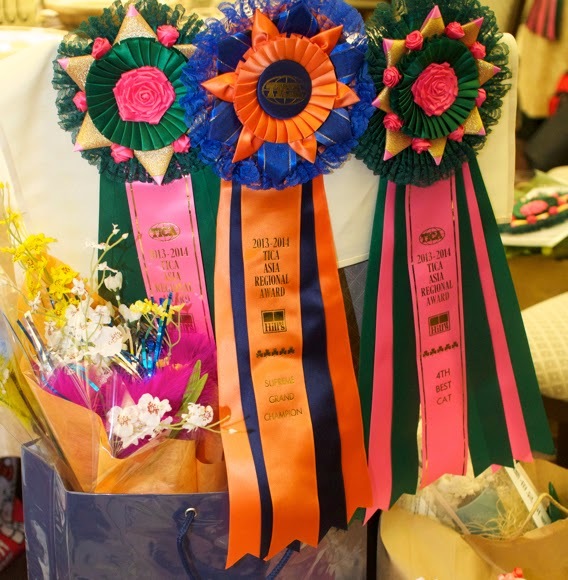 Many thanks to the owners who share the time with us at each show! We are so proud of Albert, mom Cindy and dad Ein. And also many thanks to all the ancestors whom led Albert to be born! With those ancestors and effort of the each breeder, Albert was never born. Albert is one of the representing all the things the cats and breeders/owners has done. This never have happened with out it.